A truly flawless painting surface, engineered for stability and longevity. The front and back of each panel is constructed using knot-free natural maple hardwood, which is meticulously sanded to provide a luscious surface, free of voids or seams. The laminated hardwood core gives strength far surpassing that of ordinary wood. 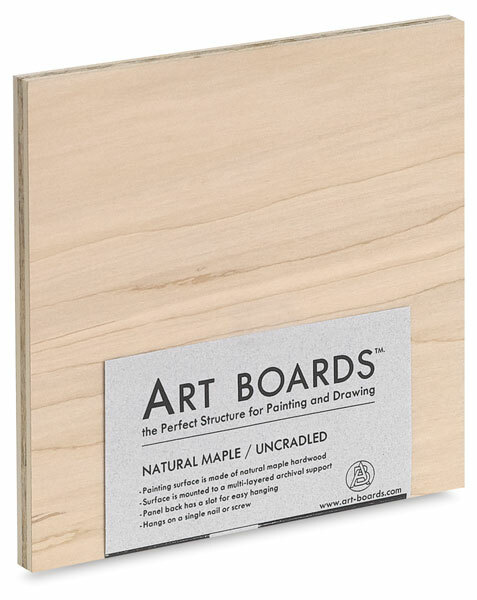 Art Boards Natural Maple Panels are perfect for traditional egg tempera painting, as well as encaustic, oil, and acrylic painting. Watercolor paper can also easily be mounted to the surface for painting watercolors or for mounting a finished watercolor or drawing. Art Boards cradled art panels are often used as the support for making portable fresco panels. Available in ½" Uncradled, 1" Cradled, and ¾" Round. Maple Cradled — A 1" thick cradle on the back provides extra support and convenience when hanging the panel flush to the wall. Maple Rounds — Panels are ¾" thick, and perfectly circular, with a keyhole slot on the back for flush wall-hanging. Maple Uncradled — The ½" thick back of the panel has a keyhole slot, to allow for hanging the panel on a nail perfectly flush to the wall. Rectangular panels have two dovetail slots for hanging. 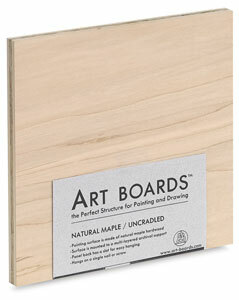 Maple Uncradled Panel, 7¾" × 7¾"
Great care is taken to ensure that surfaces are free of knots, seams, or voids. Meticulous sanding makes these panels ready for sealing or priming. Each panel has a 100% aspen hardwood wafer core and cross bands. Panels are available with and without a cradle, and in rounds.